This vanity is a great way to add traditional style to your bathroom. Its comes with a nice white marble counter and brown solid wood base for strength and style. The double-door cabinet and drawers are great for putting away bathroom items. Put a classic feel in your bathroom with this good-looking set from Wyndham Collection. 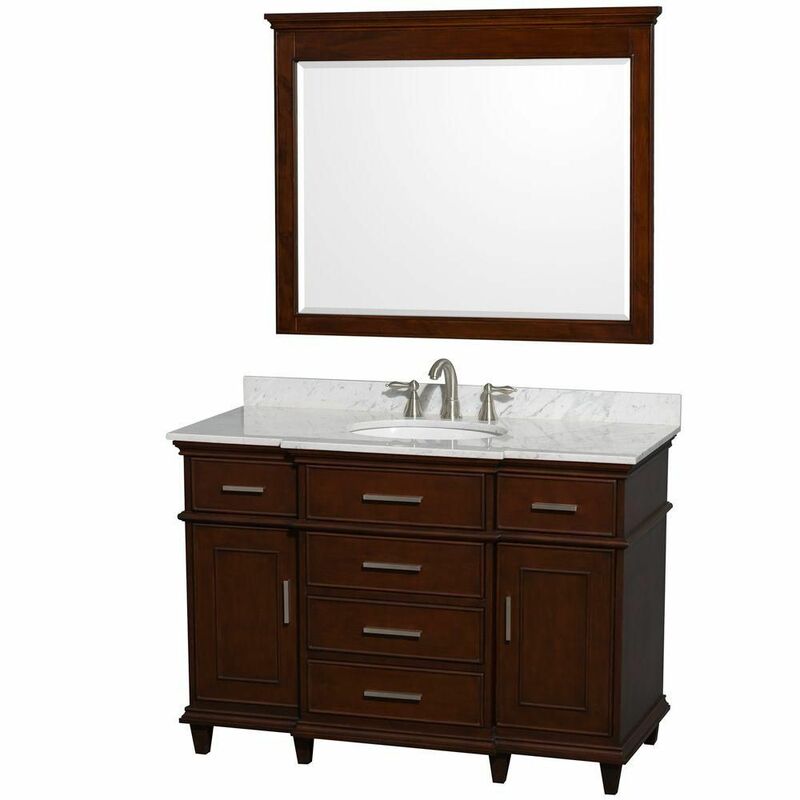 Berkeley 48-inch W 5-Drawer 2-Door Freestanding Vanity in Brown With Marble Top in White With Mirror This vanity is a great way to add traditional style to your bathroom. Its comes with a nice white marble counter and brown solid wood base for strength and style. The double-door cabinet and drawers are great for putting away bathroom items. Put a classic feel in your bathroom with this good-looking set from Wyndham Collection. Berkeley 48-inch W 5-Drawer 2-Door Freestanding Vanity in Brown With Marble Top in White With Mirror is rated 4.7 out of 5 by 7. Rated 5 out of 5 by Jewls from Just had our whole bathroom remodeled and this vanity and mirror look beautiful in it. It's ver... Just had our whole bathroom remodeled and this vanity and mirror look beautiful in it. It's very well built and certainly adds a touch of class. Rated 5 out of 5 by Josephine from Exactly as described. Great quality, solid piece.... Exactly as described. Great quality, solid piece. Rated 5 out of 5 by Anna from This was more money than I wanted to spend but by the time I did all my research adding a vanity,... This was more money than I wanted to spend but by the time I did all my research adding a vanity, vanity top and mirror, considered the quality of this product, I am very pleased with this purchase. I absolutely love it. I love the finish, the color, the quality and the quiet sliding closed drawers. Rated 5 out of 5 by larry from Excellent product Excellent product. Make sure to install and tighten the faucet and spout before installing the top on the cabinet.